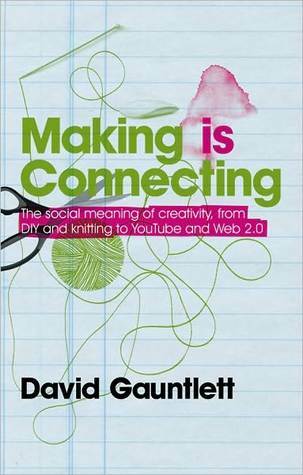 Reading David Gauntlett’s Making Is Connecting: The Social Meaning of Creativity, From DIY and Knitting to YouTube and Web 2.0 (Polity 2011), I’m reminded of my Fall 2008 Understanding Media Studies class — an “intro to grad students”-type lecture course that I built around many of the same themes that are central to Gauntlett’s book. I had meant to do something with my lecture notes — to make them into a publication, a teaching resource, etc. 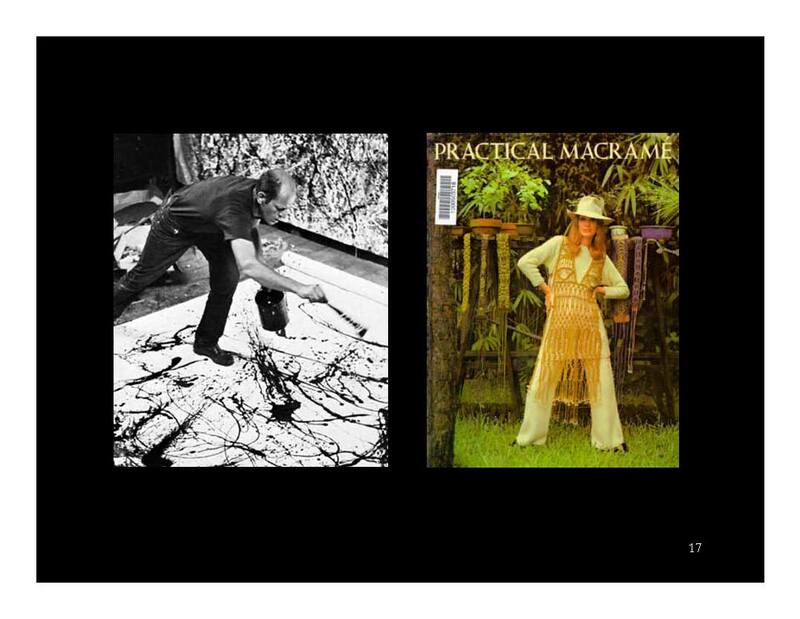 — but I never managed to find the time to make all the necessary connections among those notes to transform them into something sufficiently coherent to go public. So, I figured, since they’re just sitting idle in a folder on my hard drive, why not post them here? My lecture notes typically consist primarily of quotations and citations and factual info and concepts I want to make sure I represent accurately or faithfully (I include way more material than I end up using; I’ll have, for instance, three or four quotations that say pretty much the same thing, and I’ll choose the one that makes the most sense in the moment.) All the connective tissue — the narrative — I extemporize. I intentionally leave this “context” out of the notes because I want to force myself to be somewhat spontaneous in the classroom. Unfortunately, when I make the notes stand on their own, as they’ll have to below, I’m expecting the reader to provide that context him or herself. Which might be too much to ask. 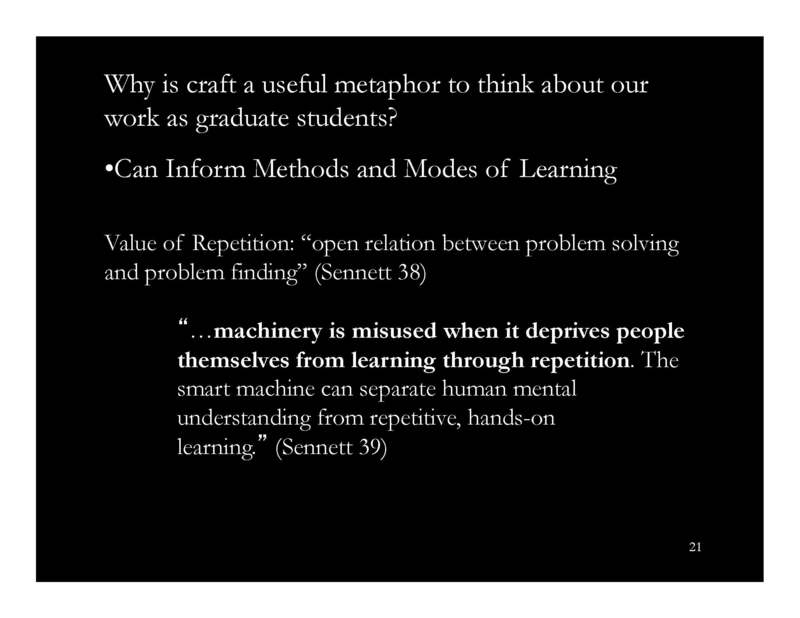 I teach in a graduate program that combines theory and practice. 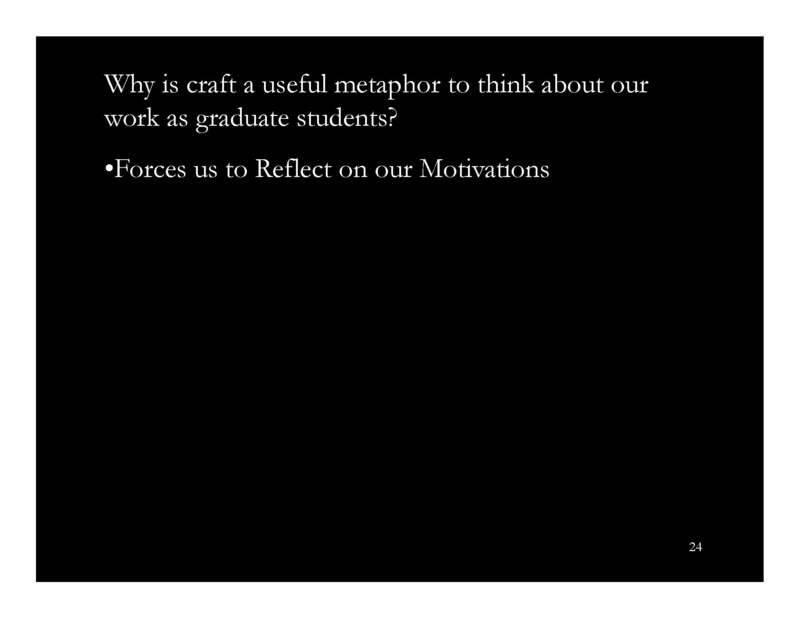 In 2008 I taught the inaugural section of a new intro to grad studies class, and one of my goals was to fill in the space between theory and practice — a space that our students typically traversed, but didn’t inhabit very comfortably. They alternated between theory courses and production studios, switched between left and right brain — but often had trouble figuring out how both could be “on” simultaneously, mutually supporting one another. 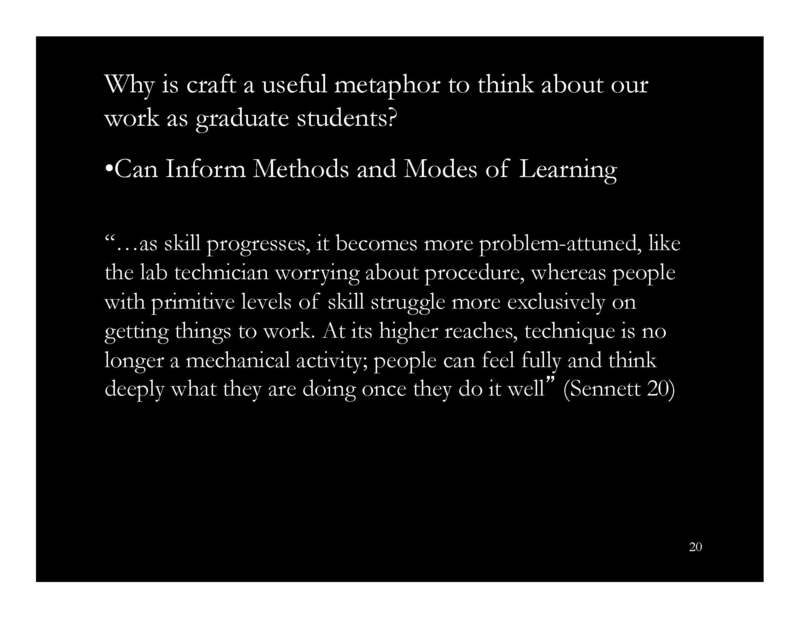 In 2007 I read a preview of Richard Sennett’s The Craftsman and thought: craft! — what a perfect metaphor for praxis! 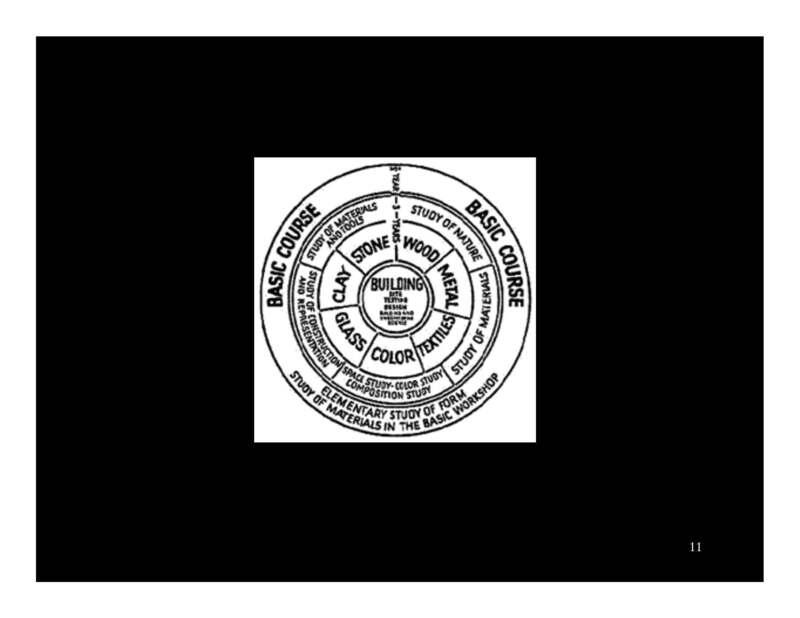 So I decided to frame the class as an exploration of the sensibilities and values of craft that were equally present in various practices: traditional scholarship, production, practice-based scholarship, management, etc. 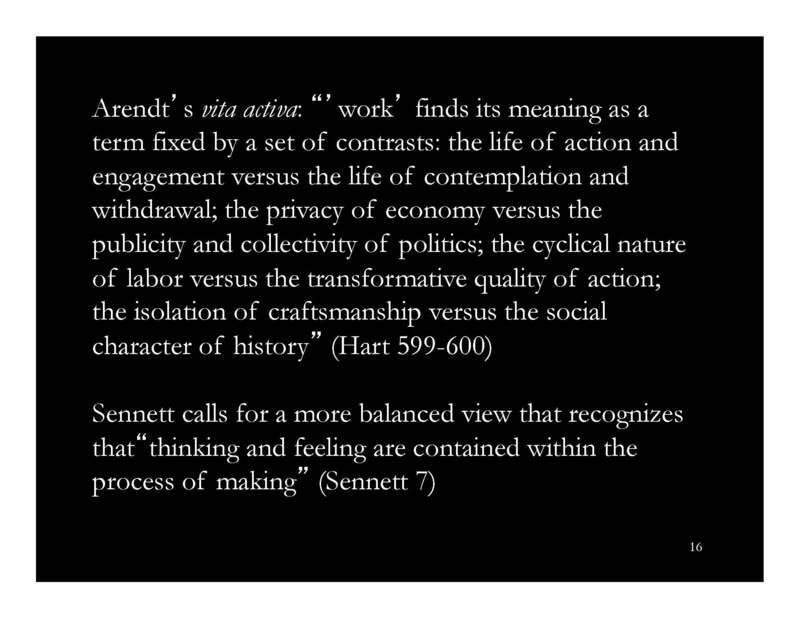 Sennett’s book was central, but I also found Malcolm McCullough’s Abstracting Craft and C. Wright Mills’ “On Intellectual Craftsmanship” to be invaluable resources. 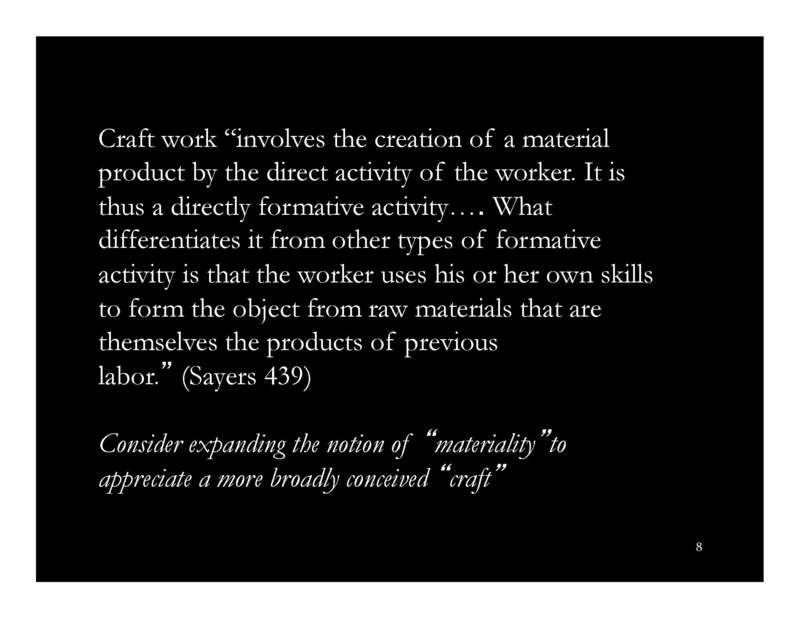 What is Craft? What is Craftsmanship? 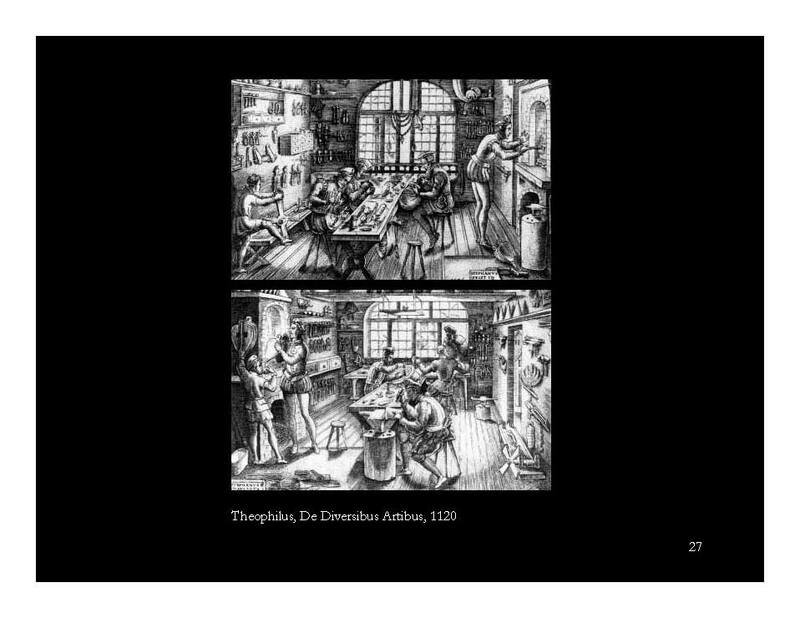 Animal laborans: “the human being akin to a beast of burden, a drudge condemned to routine”; “takes the work as an end in itself” vs. 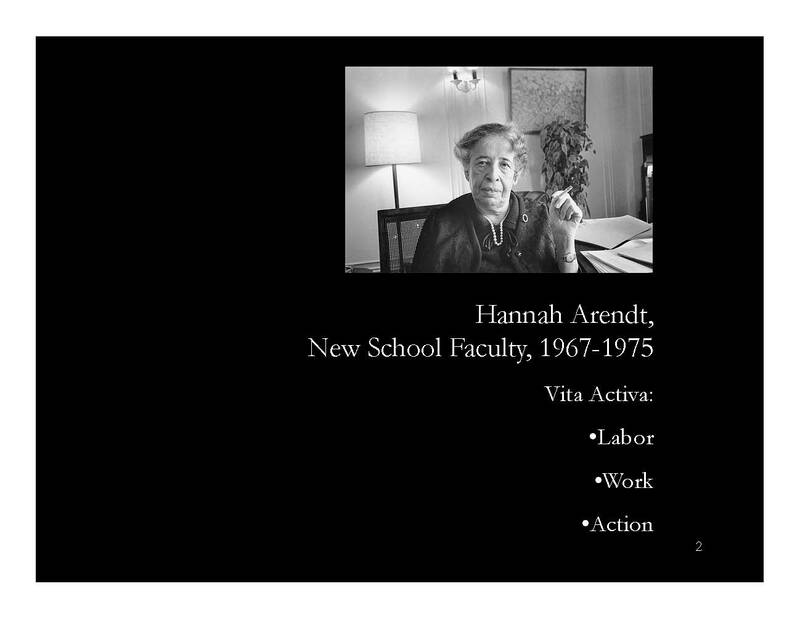 Except Arendt argues that, for homo faber, questions of “what” or “why” are replaced by questions of “how?” We are now obsessed by the process through which things come into being. Being is replaced by Process. Means trumps ends. 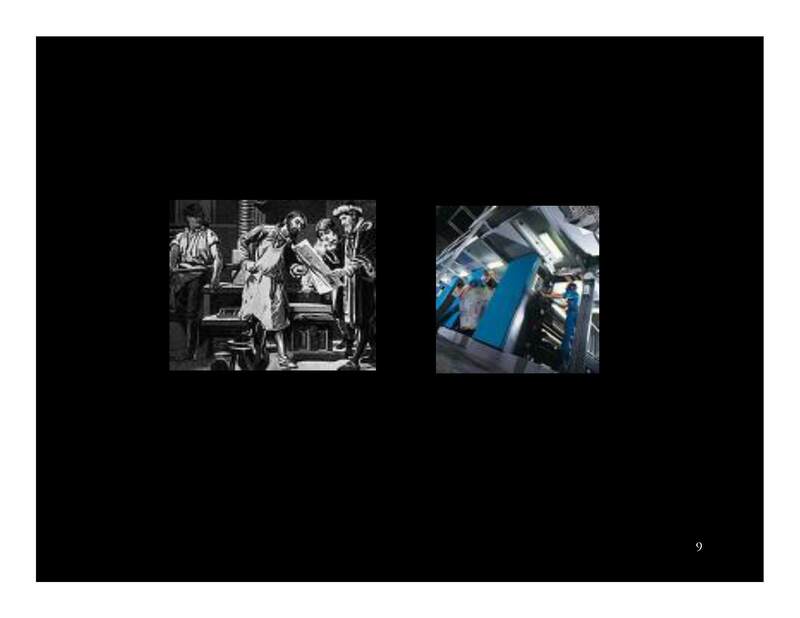 [SLIDE10] Bauhaus: “From its inception the Bauhaus was premised on the notion of a return to origins in hope of discovering a lost unity. 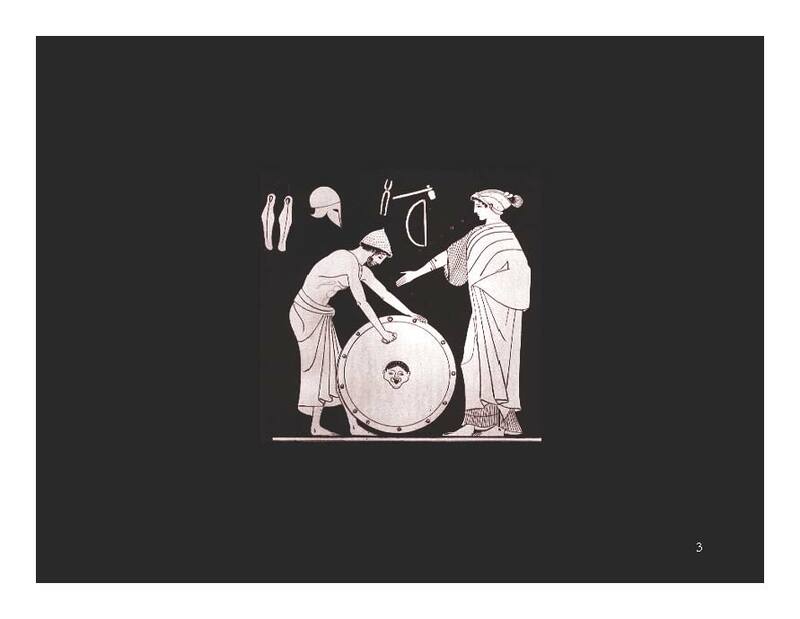 The school’s program written by Walter Gropius in 1919, charted the institution’s mission of discovery: ‘Today, the arts exist in isolation, from which they can be rescued only through the conscious, co-operative effort of all craftsmen…. 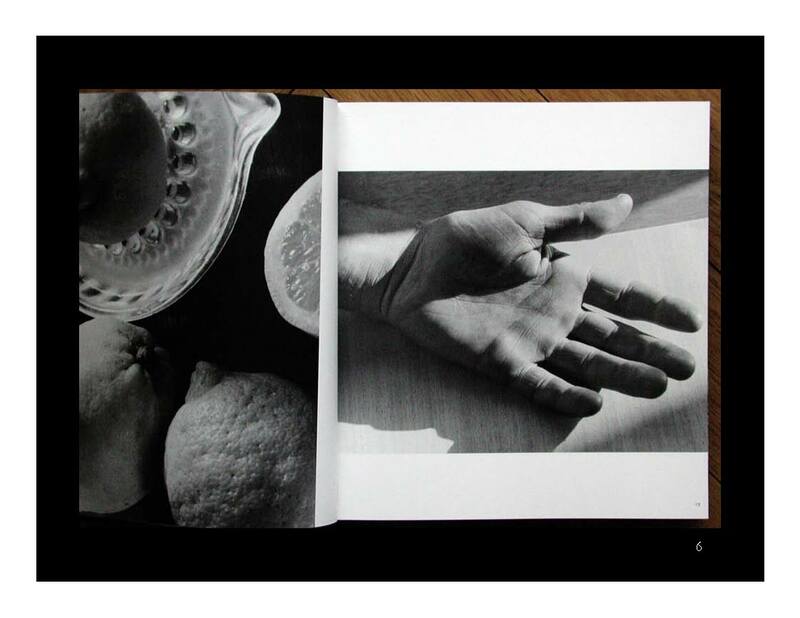 The ultimate, if distant, aim of the Bauhaus is the unified work of art…. 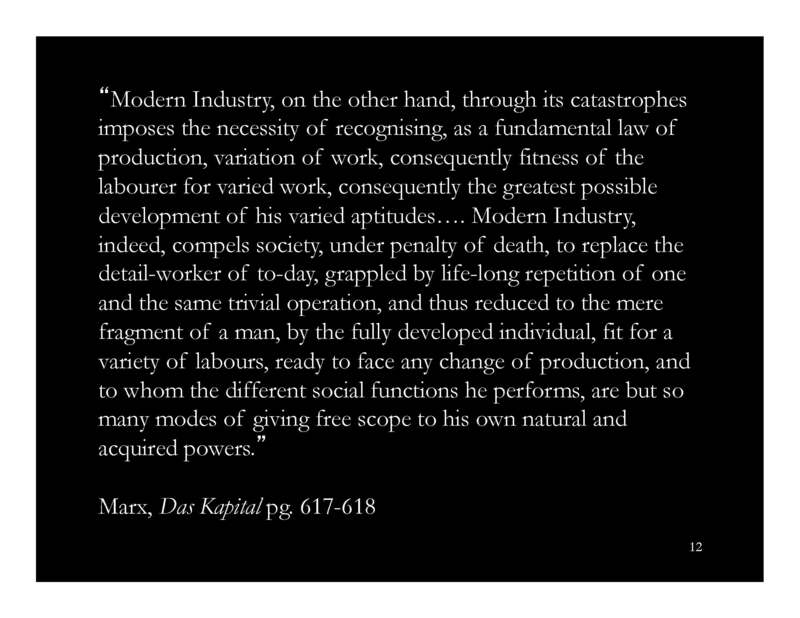 YET, according to Marx, the industrial worker is more “free” than the craftsman, because the craftsman has no identity outside of his social role. 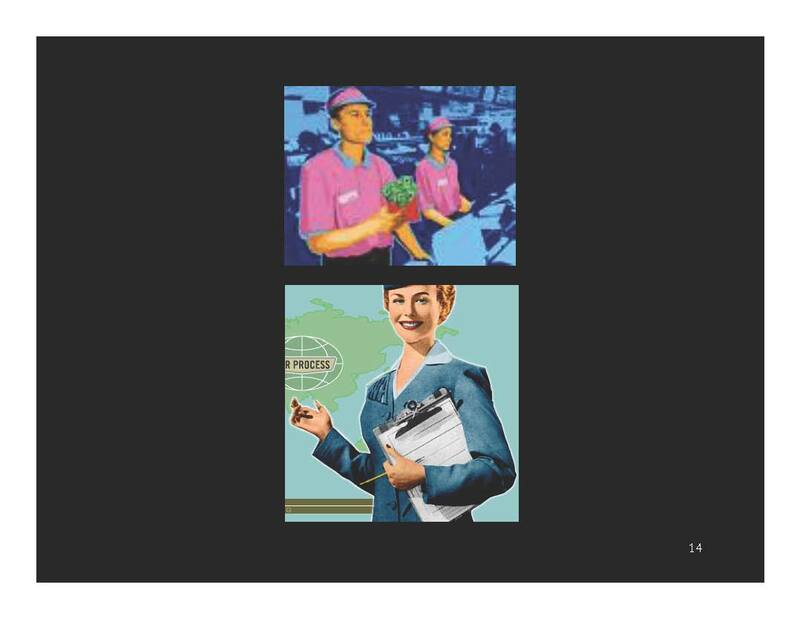 The capitalist laborer, at least, can experience his identity as a consumer in a market economy; he can conceive of himself as distinct from his economic role. 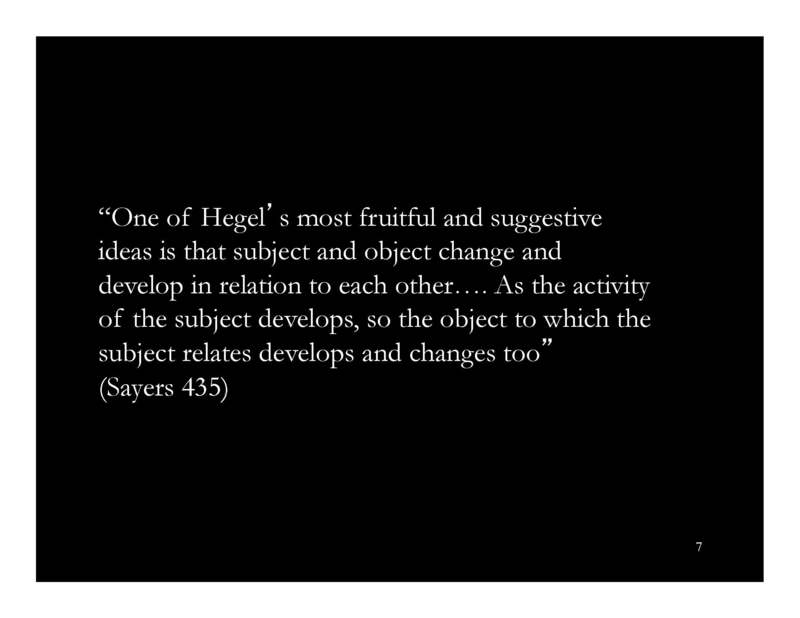 False distinction between animal laborens and homo faber , between action and contemplation, doing and reflecting. 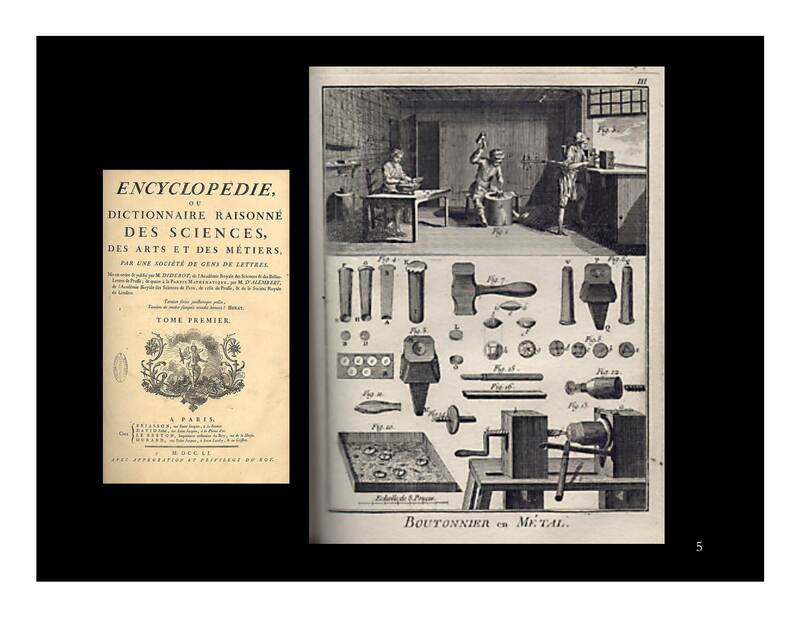 “art seems to draw attention to work that is unique or at least distinctive, whereas craft names a more anonymous, collective, and continued practice. But we should be suspicious of this contrast. Originality is also a social label, and originals form peculiar bonds with other people.” (Sennett 66) – Who is fit to judge originality? 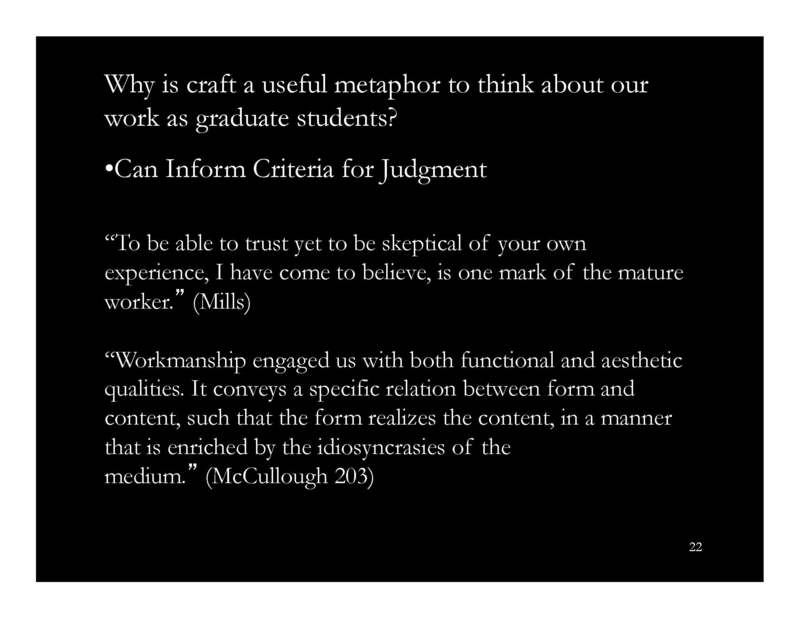 Why is craft a useful metaphor FOR THINKING about our work as graduate students? 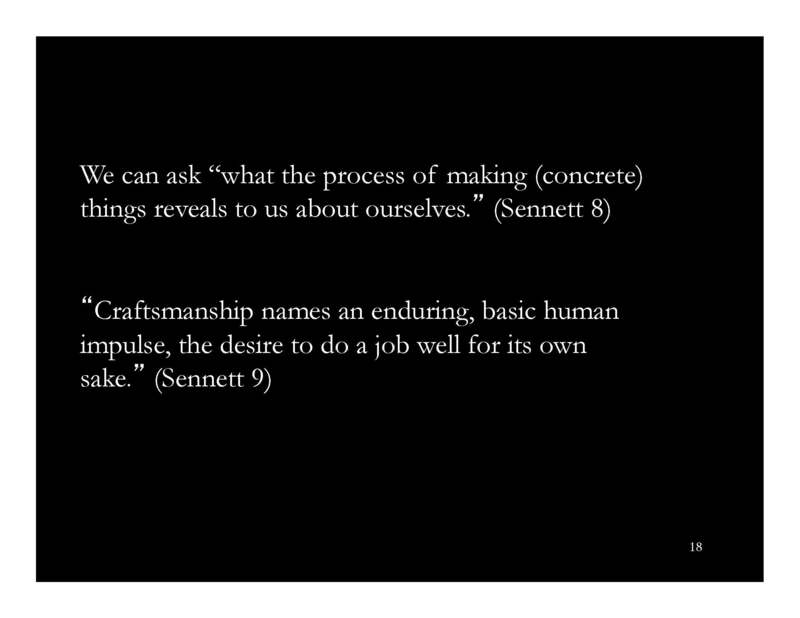 How are we craftspeople? 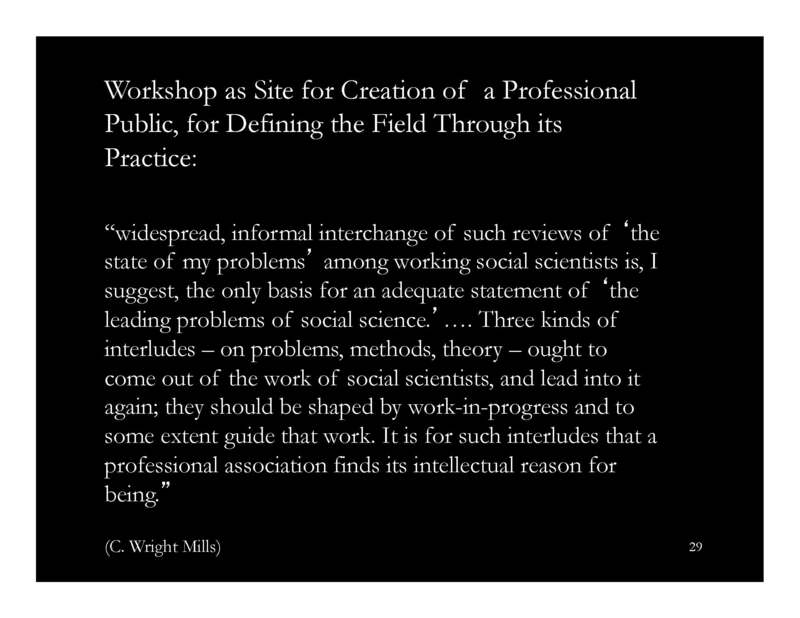 [SLIDE19] “…the most admirable thinkers within the scholarly community…do not split their work from their lives…. [T]hey want to use each for the enrichment of the other…. Where does craft take place? 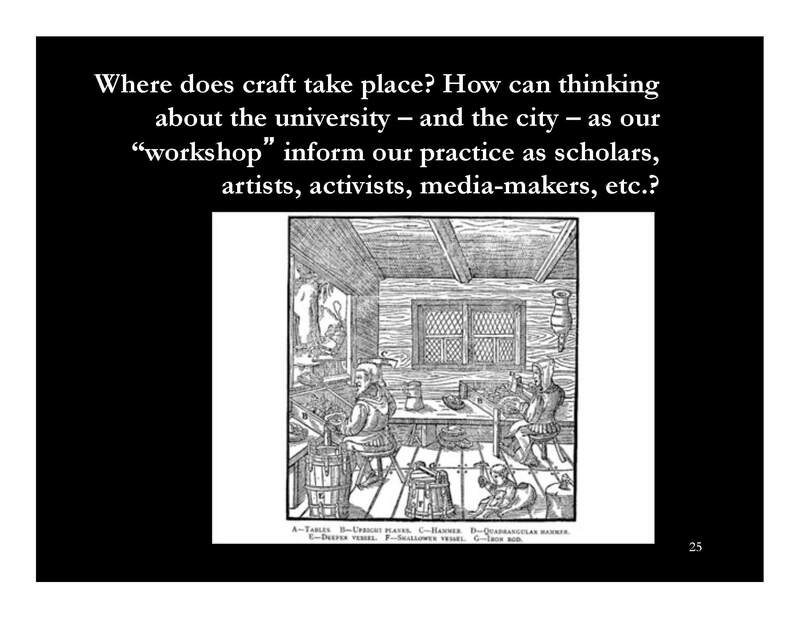 How can thinking about the university – and the city – as our “workshop” inform our practice as scholars, artists, activists, media-makers, etc.? What are the resources in our workshop? 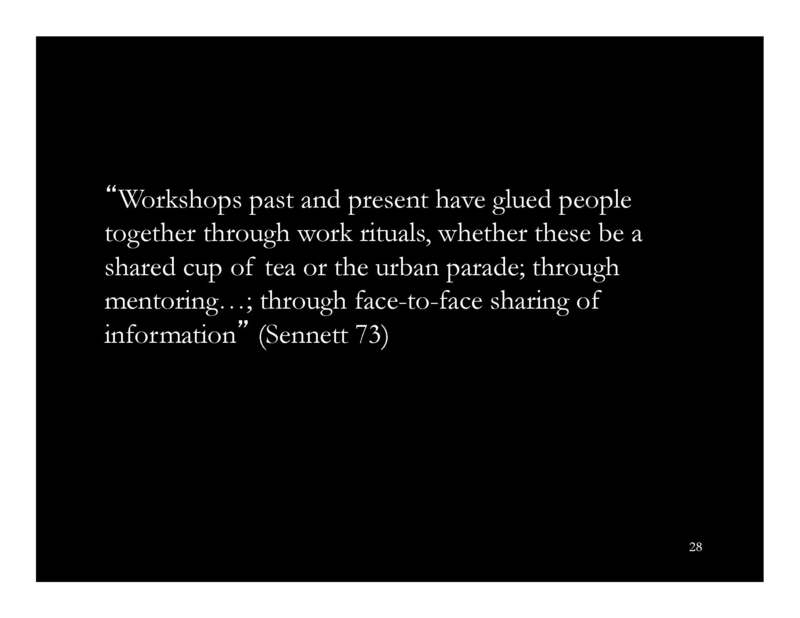 Academic Technology, Writing Center, Libraries, Cultural Organizations, Museums, Galleries, Mentors both w/in and outside the University…. 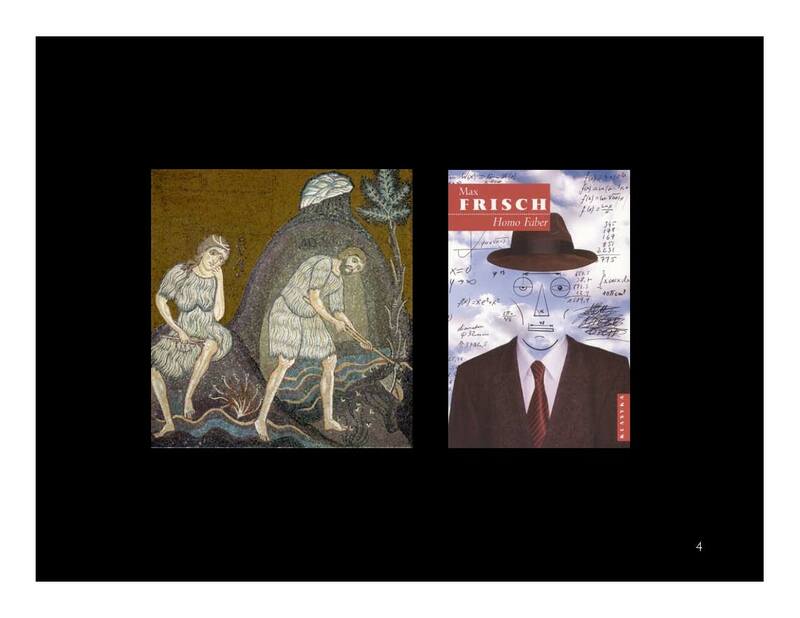 Basil B. Bernstein, Sally Power, Peter Aggleton, University of London Institute of Education, Julia Brannen, Andrew Brown & Lynn Chisholm, A Tribute to Basil Bernstein, 1924-2000 (London: Institute of Education, 2001). 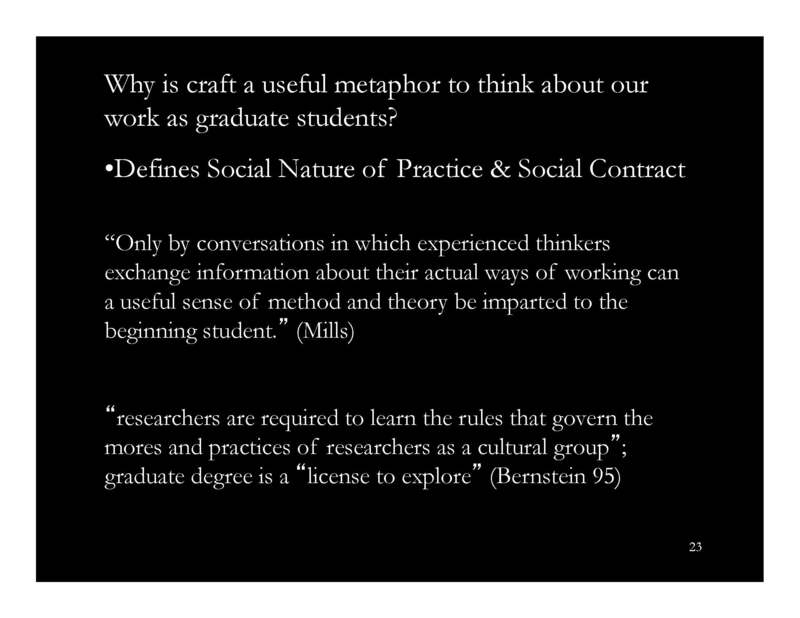 Martyn Hammersley, “Teaching Qualitative Method: Craft, Profession, or Bricolage?” In Clive Seale, Giampietro Gobo, Jasper F. Gubrium, Qualitative Research Practice (Sage, 2004). 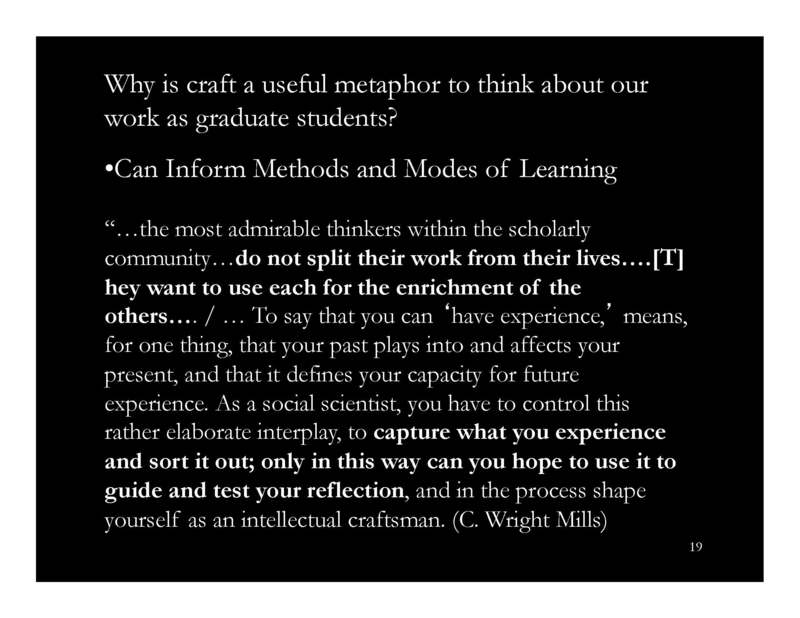 C. Wright Mills, “On Intellectual Craftsmanship” Appendix to The Sociological Imagination (Oxford University Press, 1959). 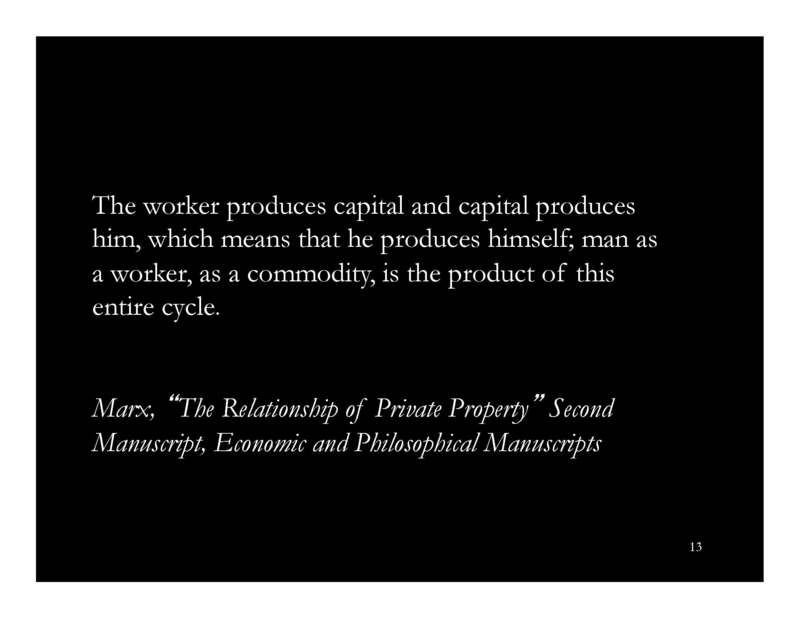 Sean Sayers, “The Concept of Labor: Marx and His Critics” Science & Society 71:4 (October 2007): 431-54. 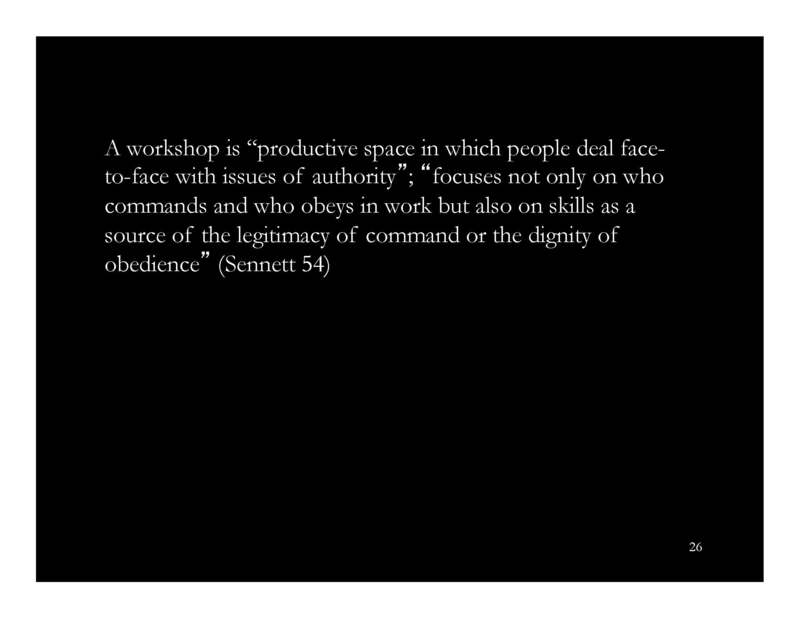 Peta Tancred-Sheriff, “Craft, Hierarchy and Bureaucracy: Modes of Control of the Academic Labour Process” Canadian Journal of Sociology 10:4 (Autumn 1985): 369-90. Rick Tilman, “Ferdinand Tönnies, Thorstein Veblen and Karl Marx: From Community to Society and Back?” European Journal of Economic Thought 11:4 (Winter 2004): 579-606. Rick Tilman, Thorstein Veblen, John Dewey, C. Wright Mills and the Generic Ends of Life (Rowan & Littlefield 2004).